Halloween is just around the corner, and I couldn’t be more excited. Truth be told, I used to loathe this holiday, what with all of the garish colors and spooky mascots, but John is an absolute sucker for Halloween, so I’ve come around over the years. To make the holiday work for me and my own style aesthetic though, I’ve found ways to adjust the silhouettes and palette so that the overall look feels modern and cheeky, rather than ostentatious and tacky. In case you feel the same way, this tutorial is for you! 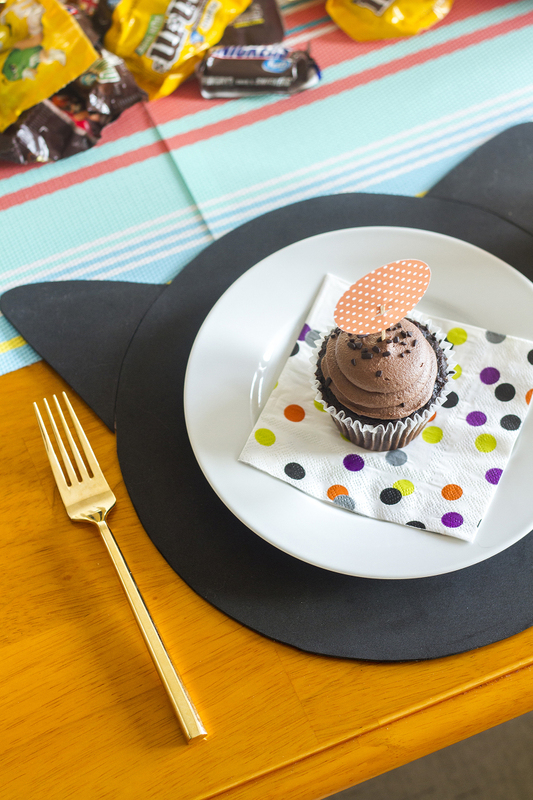 The idea was to create a set of Halloween DIY black cat placemats from simple, inexpensive black felt, and also to make easy polka dotted toppers for our Halloween cupcakes. Read on for the tricks behind these simple DIY treats, all executed with the help of some new goodies from Fiskars. 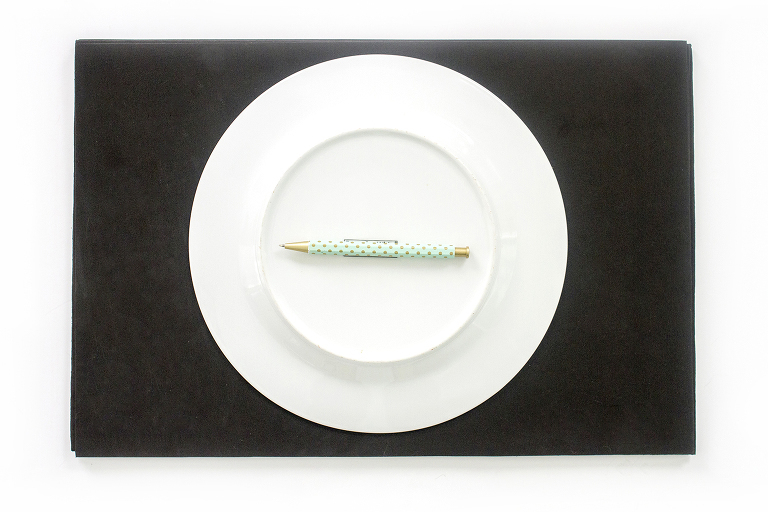 Start by laying your black felt out on a flat surface, and then place your dinner plate on top. Since these placemats are going to be for smaller appetizer plates, the larger dinner plate worked perfectly as my template. In the end, the placemat would extend a few inches past the rim of my appetizer plate. With the dinner plate sitting on top and in the center of the black felt, use your pen or pencil to trace around the edges of the plate onto the felt. Then, use your Fiskars Amplify Mixed Media Shears to cut out the circle. Since the shears are built to cut through all sorts of different materials, they are heavy duty enough to cut through felt as though it’s butter. The sharp blades made curved precision cuts a breeze, too. Repeat the steps on all four pieces of felt. Next, pick up the discarded black felt trimmings and place them back flat on the work surface. Take a piece of scrap cardboard (I actually used a piece right from the packing that my Fiskars products came in), and draw a freehanded cat ear. In peering over at my own real life black cat during this step, I noticed that one side of her ear was a little bit longer than the other, and that the lines were curved as opposed to perfectly straight. So I tried my best to replicate that on my piece of scrap cardboard with a pen. That said, a simplified and straight triangular shape will definitely get the point across if you don’t want to be so scientific about it. Cut out the cardboard ear and lay it down on the side of the black felt trimming. By using the trimmings from the circles you cut earlier, you won’t have to worry about cutting out a curved edge on the bottoms of each of your ears. Just remember, if you drew out an ear with one side longer than the other (like mine), to flip it when you trace out the other ear in the set. Finish by using your Fiskars Amplify Mixed Media Shears to cut out the traced ears. Repeat the steps so that you have four sets of cat ears. To complete your DIY black cat placemats, simply flip the cut black circles and the cut black ears over so that the traced areas with the pencil marks are facing up, and then cut pieces of heavy duty tape to attach the ears one by one to the large circle. Note that you may have to do a small amount of trimming to the curve at the bottom so that it sits perfectly flush against the edge of the cut circle. Since this project doesn’t involve glue, your placemats are ready to go right away! Before calling this project “done” though, I needed to finish up my polka dotted cupcake toppers. To make these, you’ll need to grab your Fiskars Portable Trimmer, Fiskars Thick Materials Punch, scrapbook paper, and toothpicks. Start by laying the first sheet of scrapbook paper on your work surface, and punch out four circles using the Fiskars Thick Materials Punch. I’ve used other punches before where the material gets trapped in between the blade and the plastic carriage, but this one from Fiskars was a completely different experience. It’s super strong and can even cut through cardboard, so chopping my scrapbook paper into perfect circles took all of 30 seconds. When finished punching, set the paper circles aside. Next, lay your Fiskars Portable Trimmer on the work surface and grab the first cut circle. Lift the clear armature and place the paper circle on the surface of the trimmer with the blade lined up near the center of the circle. Gently lay the armature down on top of the paper so that you feel the blade cut down into the paper. Very slowly move the blade one direction through the paper and then back the other direction, without cutting all the way across. The goal is to cut a small slit in the paper, so you need to make sure not to slice all the way across the paper. With the first slit cut, lift the armature and adjust the paper circle about a 1/4-inch over so that the blade will now line up a little ways to the left of the first cut. Again, make sure the blade is going to end up in the center of the paper circle, and then lower the armature down. Make a small cut with the blade by slowly sliding it back and forth, just as you did with the first cut. My favorite thing about my Fiskars trimmer is the measuring tool. I was easily able to situate my paper beneath the blade so that the final cuts went right where I wanted them to go. Repeat the steps across all four paper circles so that each one has to parallel slits cut into the paper. To finish, slip toothpicks one by one through the lower slit from behind and through the upper slit from the front, as pictured below. As you’ll notice in that lower detail shot, my cuts were not necessarily perfect, but you’ll hardly notice once they’re all set up and topping our festive Halloween chocolate cupcakes. Speaking of tasty goodies, it’s time to show you how it all came together. First, I took up all of our everyday striped placemats and then relaid them edge to edge in the center of the table to create a runner effect (without having to go out and purchase a brand new one!). Then, I placed a hot pink plastic pumpkin bowl in the center of the table as our makeshift centerpiece, and filled it with Halloween candy. The rest of the runner was also piled high with fun sized candy for a little more texture. Next, I laid down our DIY black cat placemats at each seat, topped those with appetizer plates, and finished with a Halloween napkin and polka-dot-topper-topped cupcake. The best part (aside from the chocolate)? The fact that I was able to pull this simple Halloween dessert party together in just a couple of hours—including trips to the grocery and craft stores—and that it came in well under budget, too. Big thanks to Fiskars, whose tools were easy to use and allowed me to speed through this project, and for their encouragement to approach the holiday with my own particular aesthetic in mind. Whether it’s trying out a new DIY craft project or tackling a seasonal holiday idea that’s been on your list for ages, Fiskars has all the precision tools you’ll need to bring your vision to life. Check back tomorrow for how to make my DIY Carved Pumpkin Face Glasses and Pumpkin Punch! 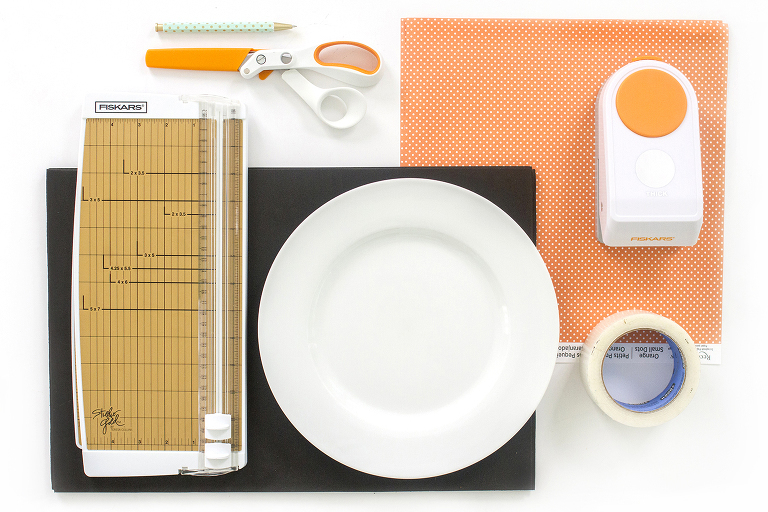 Connect with Fiskars on Facebook, Twitter, Instagram, and Pinterest for lots of ideas and inspiration.